Uriah Phillips Levy was a naval officer, real estate investor, and philanthropist. He was a veteran of the War of 1812 and the first Jewish Commodore of the United States Navy. 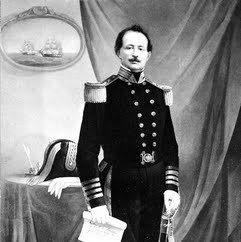 He was instrumental in helping to end the Navy's practice of flogging, and during his half-century-long service prevailed against the antisemitism he faced among some of his fellow naval officers. An admirer of Thomas Jefferson, Levy purchased and began the restoration of Monticello in the 1830s; he also commissioned and donated a statue of Jefferson that is now located in the Capitol Rotunda; it is the only privately commissioned artwork in the Capitol.